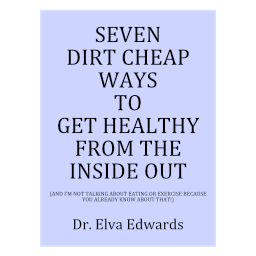 health – Dr. Elva Edwards, D.C. I have a video today that will, hopefully, enlighten you as it did me. The video is about fasting, but before you leave the page, know that studies have been done with people are are taking chemo. The studies show that our bodies have been programmed, genetically, to help us out when we are fasting. Cancer cells will be weaker while normal cells will be stronger. But no one wants to give money to provide studies on fasting. Sometimes we just can’t take the easy route, can we? Fasting was helpful to mice and helpful to people. That shows that over time, people have been programmed to allow fasting to help us with disease processes or sickness. More study needs to be done with other disease like RH, MS, and many others. Today’s health tip is really simply to let you know what is going on in this area. If you haven’t ever fasted, it will be enlightening. We are so afraid of not having food! Yep that is me! One woman in the video was not feeling very well on day 4 of her fast. And when she got up on day 5, she felt so good. This video is informative and I hope you will watch it and then email me telling me how much you enjoyed it!! People watching is an interesting business, especially in the summer. The beach is the best, but anywhere will do. Watch people as they walk, and their posture will talk to you. You can tell if they are in pain while walking. You can tell if their head juts forward or if one shoulder is higher than the other. It is one thing to see it in others. But look in the mirror. Do you have postural distortions? As I tell my patients, let’s look at the long-term picture. It isn’t just about what is happening today, but we want to have good posture in 20 years from now. Like Roger Dangerfield (for those who might remember him), posture gets no respect. There are many studies that correlate posture with health. Your posture speaks volumes. And to change it takes work. As long as you are healthy, doing a little work on your posture each day will pay off dividends. So today, look in the mirror and notice your posture. You might even take a photo of yourself. Over time, continue to notice and see if you can make corrections. You change posture through strengthening the stretched muscles and stretching the tight muscles. If you need help to determine what those are, come in and see me! Do you sometimes wish you could be your own doctor? In a sense, you are our own doctor when you make decisions about your health on a daily basis. Some examples are: what you choose to eat, how are choose to move your body, how much sleep you get and how you offer self-compassion? The answer can be determined by one question: how much do you love yourself? Love yourself enough to do what you can for the health of your body! Having been in practice for twenty-nine years, I know, it is much more important what you do everyday for/to your body than what we do on rare occasions. Some people choose to buy all kinds of gadgets to, in some way, help them with their health. New technologies allow you to wear a bracelet that will track your exercise and sleep. Depending on what price you pay, you can have many more statistics tracked such as heart rate. Some people have equipment in their homes such as a stationary bike or an inversion table. We could have a whole room in the house just for health! I have found a wonderful product that would be a great addition to any home for the purpose of increasing your health. Actually, I have fallen in love with the Biomat.. The synergy of amethyst crystals, far infrared heat and negative ions creates a healing energy. Many people think it looks and feels like a heating pad, until they use it. After using it, people realize it is much more than a heating pad. Some people can feel it right away while others have to get a dose of 45 minutes or so, and some people need days of repeated use. If you go to my website at www.drelvaedwards.com you can navigate to Biomat. It will take you to an information site where, at the bottom, are numerous videos. I suggest watching one video, the one by Gail Soucy. She does a good job of explaining the Biomat, within the FDA guidelines. Remember the far infrared rays penetrate six to eight inches into your body whereas a regular heating pad only heats the area on the surface. And the far infrared affects the whole body where a heating pad only affects the location the heating pad is touching. It is known that amethyst crystals are the best delivery system for the far infrared rays. Another reason I like the Biomat is that the controller grounds the EMF’s so you aren’t receiving those negative frequencies. The Biomat is made in Korea and is used in the hospitals there. It is available worldwide. No matter where you live, you could enjoy the benefits of the Biomat. I have liked it so much that I have become a distributor. And I have a couple of loaner Biomats because I like the idea of giving people an opportunity to try it before buying. The Biomat is inexpensive at $670 plus $40 for shipping. After the purchase, you can use it for thirty years. What else can do as much as the Biomat does for your health for that price and for that long? It is a real bargain! Anything that can reduce swelling and inflammation in the body is a gift. And the other gift is you simply sit or lie on the mat while it relaxes and rejuvenates. What else can you do that revitalizes while you are sitting? Much is written about how inflammation is the root cause of so many health problems and the Biomat will help your body with inflammation. If you are in the Denver metro area, feel free to call my office and borrow one of my loaner Biomats. If you don’t live in the Denver metro area, know that all purchases can be returned within the first seven days. Most people will feel the benefit within that time frame and know that the benefits will keep accruing. The FDA does not allow anyone to use the name of a disease in relationship to the Biomat, which makes it difficult to explain the results people have had. The Biomat is a gift to the world of suffering people. You make the choice for your health today! Feel free to call my office with any questions. Please leave your comments if you have used the Biomat. Let’s us know what you think!